Thank you for taking the time to visit our webpage. Farm Parts Online is the online ag store for Mid-West Made LLC. We don't make everything that we sell. We wish this was possible, but it isn't economically feasible.Please take a moment and review how our part number system works. 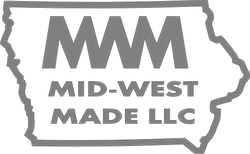 MWM-Parts made/assembled by Mid-West Made LLC. M-Parts that we purchase from other suppliers for resale. We manufacture our parts with our in house cnc equipment. This includes cnc plasma, cnc router, cnc press brake, and we source some parts made by cnc laser. This allows us to to make replacement parts to exacting standards. Our parts are either powder coated or painted. Let us put our over 30 years of agricultural experience to work for you. When you call you will speak to someone who has real ag experince. Not someone reading off a computer screen.